I've been using a Razer BlackWidow 2013 with Cherry MX Blue Switches recently, but I finally dived deep into the keyboard hobby. I've got an iKBC New Poker 2, a Drevo Gramr that I use at work, both with Cherry MX Browns. I'm planning to get a Vortex Pok3r, build my own keyboard, and buy some keyboards that use Topre swotches too. Anyone else a keyboard enthusiast? IBM Model M? Edit: My POK3R came in, and first thing I did was to replace most of the key caps. Here's a shot of all three of my personal keyboards (Drevo Gramr is at work, and not coming home unless I move to another job). 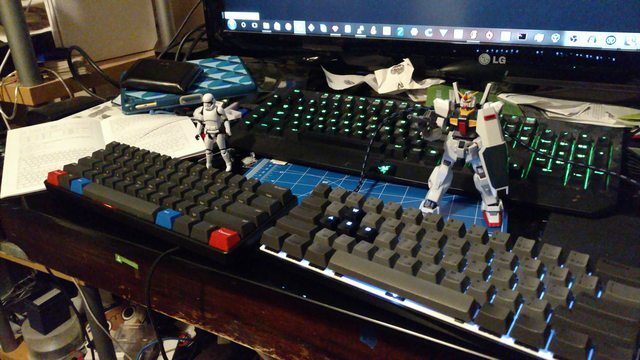 Here's a shot of my home keebs, with a First Order Stormtrooper and High Grade Gundam Mk2 RX-178 for scale. Potato quality- I don't have a working DSLR or Mirrorless right now. I currently use an ergodox infinity keyboard. Cherry mx browns, black dsa keycaps. Got some homing bump keycaps from pimp my keyboard, overall I'm very satisfied with it and use it as my daily driver. I'm mostly on a laptop but it's well built and the keys are responsive enough for what I do. I prefer to spend my money on core components for my PC such as CPU, GPU and RAM. However, if I could, I would delve into this. Where's a good place to start if I were to get into this?